that's just fabulous: So You Want to Grab a NARS Foundation? So You Want to Grab a NARS Foundation? As many of you have probably noticed by now...by biggest makeup weakness is without a doubt NARS. Being as big of a NARS fan as I am, it's only natural that over time I've collected their three foundations. NARS is all about having glowing, your skin but better finishes; but they are all very different in nature. I definitely play favorites, and have a lot of thoughts on each so if you're thinking about picking one of them up for the first time I hope this post is helpful! Pure Radiant Tinted Moisturizer : This is the base I've been using the most lately. It's very hydrating, dewy, and a light/medium coverage that can be built up easily. For this one I use the shade Alaska which is a light, but neutral shade (not too warm and not too cool) and it matches perfectly. The formula is lightweight and creamy and blends into the skin easily. I tend to use a buffing brush with this one for the best results. It also contains SPF 30 which is an added plus in my opinion! Sheer Glow : Sheer Glow is an incredibly popular foundation and for good reason - it has an incredibly broad range of shades and it blends like a dream. Even though the name is "Sheer Glow", it's neither sheer nor super glowy. It has a medium coverage with a semi matte finish that looks very natural. Sheer Glow is really great for combo/oily skin (meaning it's not always my first choice since it can cling to some of my dry spots). In terms of color I was matched to Gobi which is a light shade with yellow undertones. It matches fairly well, but sometimes I do think it would be good to test Deauville which is more of a neutral shade. All Day Luminous Weightless Foundation : Luminous Weightless tends to be the option I reach for the least - due to it's tendency to cling to my dry patches (oily, acne prone girls - this one's for you!) For myself, I have to load up on a super rich moisturizer to wear this one. If I'm having a really great non-dry skin day then this formula is stunning on. It's a matte finish that easily covers up redness and evens out skin tone. The foundation itself is super fluid (thank goodness they added a pump to this one), easy to buff into the skin, and feels super light on. Like Sheer Glow it also has an expansive range of colors. Oddly though - they matched me to Mont Blanc which is a light shade that has pink undertones to it (probably another reason why I don't reach for it as much since I tend to be more of a warmer/neutral shade). 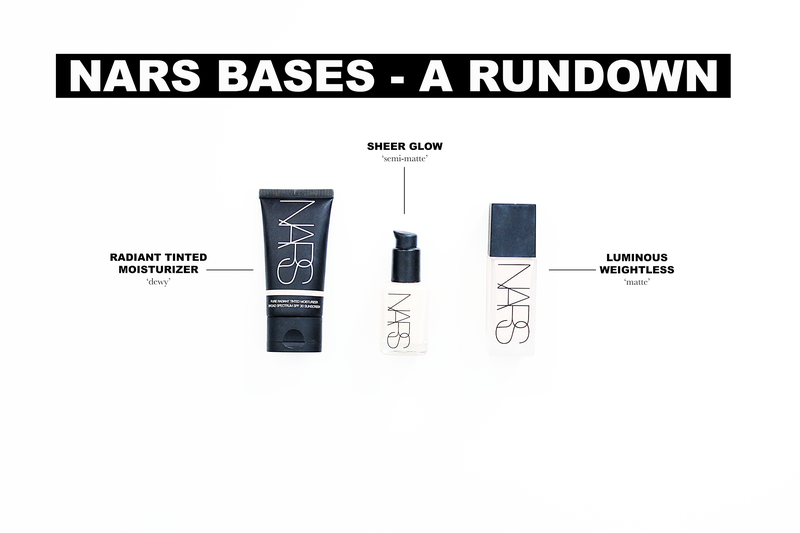 Do you swear by any of NARS' base products or are you planning to test any of them out? If so, let me know in the comments below!